Football is, ultimately, a sport that revolves around the people on the pitch. Knowing the talents of the individual that make up the two sides that are competing in the match that you’re betting on with put you in the best possible position of having more money to play with at the end of your betting run. In this instance that’s a reference to whether or not select players have the ability to put the ball in the back of the net and, more specifically, when they’re likely to do it. The First / Last / Anytime Goalscorer markets are popular ones because they give you better odds than the more broad option of betting on whether or not a team as a whole will score a goal during the match that they’re playing. On this page I’ll have a look at the three different types of bet, explaining how they all work and exploring what happens to the bet if a specific incident occurs during the game, such as the first goal being scored before the player is on the pitch. How Does the Bet Work? A quick look at other pages on this site will show you that I’m a firm believer in explaining how bets work for those that might not already know. The worst thing that you can do in betting is assume that someone knows what you’re talking about when it’s entirely possible that they’ve never placed a bet before in their life. The one bit of credit that you have to give bookmakers is that they give their bets nice and simple titles most of the time. This bet says that you think that a given player is going to score the first goal of the game that you’re betting on. It’s that simple. If they do indeed score the first goal then your bet is a winner, whilst if another player manages to get on the scoresheet before them then your bet will be a loser. This bet also has a title that tells you everything you need to know about it. You’re betting here on your chosen player scoring the final goal of the game, so it doesn’t matter if a goal has been scored already by the time your player bags one. In fact, there can be anything from one to one-hundred goals and as long as the very last one of the game is scored by your player then your bet will be a winner. You can see from the screenshot of the Paddy Power odds that they are usually identical for the Last Goalscorer Market as the First Goalscorer one. Very occasionally this might not be the case, but that’s only if a player has made a name for themselves by only ever scoring the opening or closing goal of a game. If you’ve been paying attention then you’ll know exactly what I’m going to say this bet is about. Here you’re placing a wager on a player scoring at any point during the game, so it doesn’t matter if someone has scored before them or someone scores after them. Your bet will be a winner as long as the player you’ve placed it on gets themselves onto the scoresheet at some point during the match. If you again refer to the Paddy Power odds, you’ll see that Anytime Goalscorer odds tend to be longer than First and Last Goalscorer markets. That’s because a player could score the third goal in the game but it might not be the final one, whereas if they score the third and you’ve placed an Anytime Goalscorer bet then it doesn’t matter if someone scores after them. There are a couple of different things that you’ll want to remember when you’re placing, or have already placed, bets on the First / Last / Anytimes Goalscorer markets. The first is that Own Goals don’t count. That means that if the first goal is an Own Goal and is scored by the player you placed your bet on then it won’t be a winner – they have to score for the club that they play for in order for it to be counted. The good news is that most bookies treat Own Goals as though they don’t exist when it comes to the Goalscorer market. If there were two goals in a game and the first one was an Own Goal then the second goal will be used to settled all bets. A one goal game settles all bets as winners if they’re placed on the correct goalscorer. What I mean by that is, say you placed a First Goalscorer bet, a Last Goalscorer bet and an Anytime Goalscorer bet on Jack Grealish in the Aston Villa versus QPR match from above. Well, if Jack Grealish scores and his is the only goal of the game then all three of those bets will be winners. That’s because he’s scored at Anytime, he was the First Goalscorer and he was also the Last Goalscorer. Something else to think about is that, unless otherwise stated, you’re betting on the ninety minutes of the main game of a football match. That is to say, if you’re betting on a cup match and it ends up going to extra-time and penalties then it doesn’t matter if your player scores after the full-time whistle is blown at the end of the normal period of time. They can go on to score a hat-trick in extra-time but unless your bookmaker specifies that bets will include any extra-time period then those goals won’t count towards your bet. That’s different from added injury time, of course, which counts as being part of the ninety minutes as far as bookies are concerned. 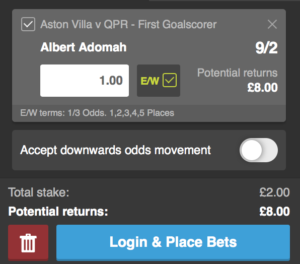 There’s another type of bet that you can place on the First Goalscorer market, which is an Each-Way bet. As with something like horse racing, the Each-Way bet gives you additional places within your bet. That means that if you place an Each-Way First Goalscorer bet and your player doesn’t score first but does score the second or third goal then you’ll still get a payout. Again, though, as with horse racing, the payout won’t be as large as if they’d scored the first goal outright. This is a way of mitigating your losses if you think the player you’re betting on is going to score but you’re not 100% sure when during the game they’ll do it. You’ll get better odds than opting for the Anytime Goalscorer market, which is why it’s worth considering. 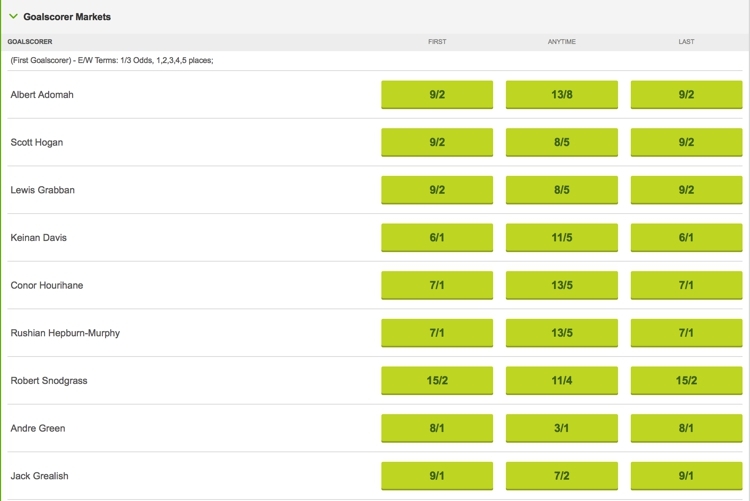 As you can see from this look at the Paddy Power odds, they’ll pay 1/3 odds for five places. That means that you’ll get some money back if your player scores anything from the first to the fifth goal in the match. 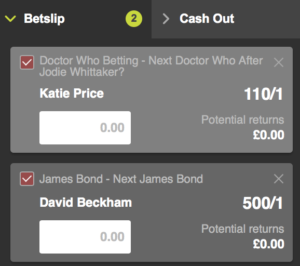 Some bookmakers offer Insured First Goalscorer bets, such as Paddy Power’s Insurebet First Goalscorer option. This is slightly different to an Each-Way First Goalscorer bet, as you don’t get paid out if your player scores later in the game but doesn’t get the First Goal. In other words, instead of getting paid out at reduced odds if your First Goalscorer selection scores later in the game but didn’t net the first goal, you’ll get your stake refunded back to you. What if Your Player Doesn’t Start? There are numerous circumstances that might lead you to place a bet on a player that doesn’t end up starting the game. If that happens then don’t worry, you can still end up winning your bet, depending on which type you’ve placed. If there’s been no goal before your player comes on then the bet becomes live the second that they do, meaning that if they score at that point then your bet will be a winner if it’s an Anytime Goalscorer bet or First Goalscorer bet, or it’s the final goal of the match and you’ve placed a Last Goalscorer bet. If there’s already been a goal before your player is substituted on then what happens to your bet will depend on the type of bet that you placed. If you went for the First Goalscorer option then your bet will be made void. If you’ve opted for a Last Goalscorer or Anytime Goalscorer bet, however, then your bet will be active as the scoring of a goal before then makes no difference to it. Of course, if your player appears on the pitch for even one second before the full-time whistle goes and doesn’t score then your bet will become a losing one. The odds on Peter Crouch to be the First Goalscorer for that game were 6/1, with odds on a full-time score of 3-3 being 90/1, yet the combined option in the Scorecaast gives odds of 360/1. You can see here that the overall odds change depending on the overall outcome of the game that you opt for, even if you stick with the same First Goalscorer. A Crouch goal obviously makes a win for Stoke more obvious, given that he plays for them, so the odds are 15/2. A Crouch goal means that a draw becomes less likely, so the odds are longer at 33/1. Finally, a Crouch goal means that Everton would need to score two to win the game, so that’s the option with the longest odds at 50/1. Interestingly, the No Goalscorer market can sometimes give you better odds than opting for the 0-0 in the Correct Score Market. In the Stoke versus Everton game, for example, the 0-0 Correct Score was 15/2, compared to 6/1 for No Goalscorer. That’s because the No Goalscorer option includes the possibility of Own Goals, given that they don’t count towards the First / Last / Anytime Goalscorer markets. That means that you could bet on No Goalscorer and a match could feature ten goals, but as long as they’re all Own Goals your bet will be a winner with most bookmakers. If you’re looking at placing a bet in the First / Last / Anytime Goalscorer market then there are a few things you can think about before going ahead with your wager. In short, research is your best friend. Are there any players in a team that have a habit of scoring opening goals in games? Are there others that tend to be used as substitutes and specialise in coming on late to score goals? Another thought you’ll want to have is whether or not teams tend to have specialise set-piece players. After all, some sides have players that seem to be able to score goals out of nothing simply because they know how to take free-kicks. If that’s the case then they’ll be worth considering for Anytime Goalscorer bets, especially if they tend not to be big goalscorer the rest of the time.